Products of Alem Teknik AB Sweden, Grippers, cable lock and many more. 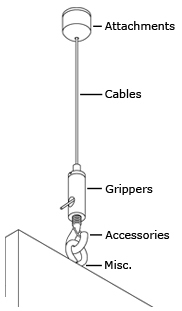 Attachments are used to fix the cables to ceilings, walls or floors. Stainless steel and zinc-plated cables are available in various dimensions and lengths. Compact designed grippers allow swift installation and instant adjustment. Various accessories such as pull switches, cable clips and lock screws. Here you can find other products we made for different business.